The exhibit was full of kids & parents. It seemed like there were more kids than adults. And well, big children population is synonymous with big noisy commotion of lovely little people. I was wrong. 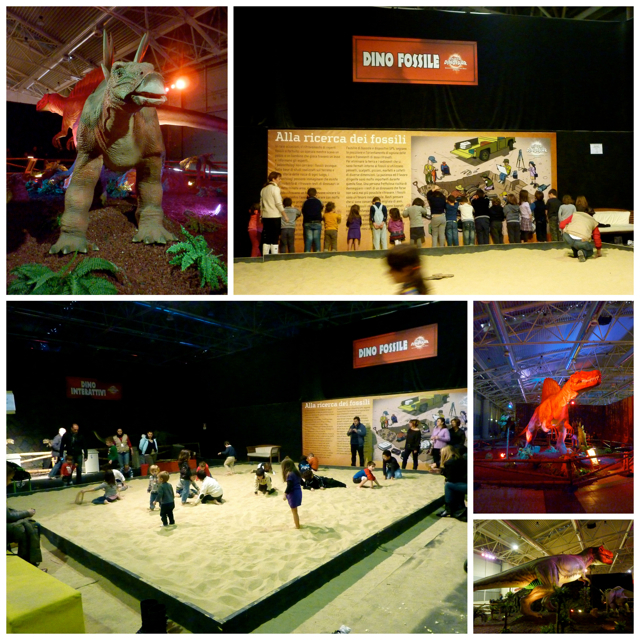 I could actually hear the humming and whirring of the robotic dinosaurs in the exhibit. I was confused whether we ended up in the midst of a big group of adults shorter than 4 feet or a big group of mute children. I checked again. They are children and they do speak! I found out why after a few minutes of walking around in the semi-darkness. They were terrorized of the magnitude of the dinosaurs. My own kids were big-eyed with their lips completely shut. And, they were walking alongside us for once. I was stopping myself from tapping one of the dinosaurs and ask, "Excuse me Signor Dinosauro, can you I take you home? You would be a very good nanny for my kids because you seem to have a calming effect on them." After a few oohhs and aahhhs, my kids finally found their voices again, a pitch higher than usual and a bit fast forward resembling The Chipmunks. Excitement finally overruled fear. They were enjoying the dinosaurs. No need to tap the shoulder of that T-Rex then. And the grand finale of the exhibit was a gargantuan sand box to dig for fossils. If only I knew about it, I would have dressed them both in spandex and brought my mini vacuum cleaner. I was gripped with stress thinking about the amount of sand they will cover their clothes and bodies with. But what can I say? Enjoy swimming in the sand kids! Which they did and which I saw other kids practically showering themselves with sand with tight lipped parents nearby. My mirror images. I was sad with what I saw. I realized that I am too uptight as a parent. I started the exercise of breathing in and out with emphasized slowness. It worked... until they walked out of the sandbox. Oh my God! They are the walking resemblance of the gnocchi I frenetically dusted with flour. I have to dunk these two in water. Dinner was something simple and healthy. After the chips, sodas & hotdogs (and sand) we had for lunch, I felt like wiping the slate clean again and restart with something nutritious and unblemished. 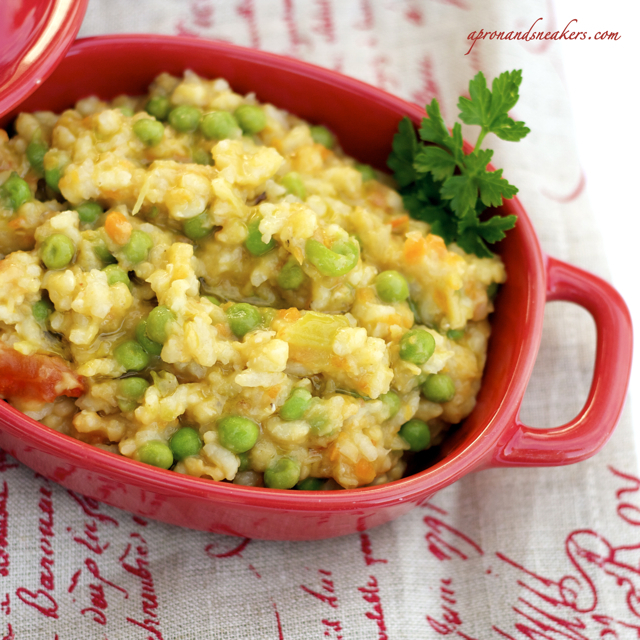 I had a pack of Rosa Marchetti rice which I read is rare nowadays and a pack of red lentils. 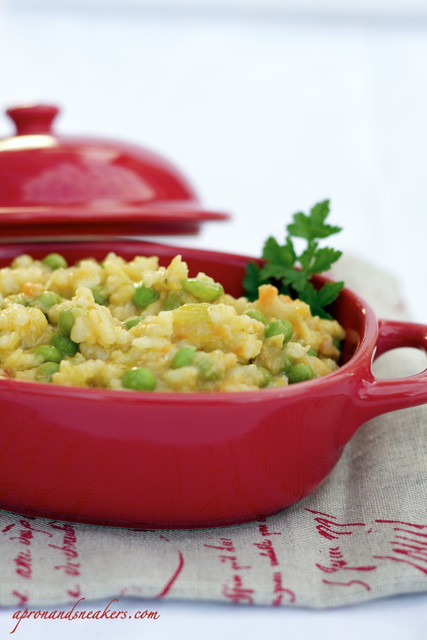 Risotto with red lentils and green peas seemed like a perfect Sunday dinner after spending an activity-laden day. It's a homey recipe with familiar tastes and perfectly ends our invaluable weekend together. Over medium heat, in a saucepan with extra virgin olive oil, sautè the onions, carrots, celery and tomatoes. After tossing together for about 10 minutes, add the lentils and rice then toast for 3 minutes. Pour half of the hot broth in the saucepan, let it boil then simmer on low heat. Keep on ladling the remaining hot broth gradually while cooking. Stir frequently to avoid sticking to the pan. 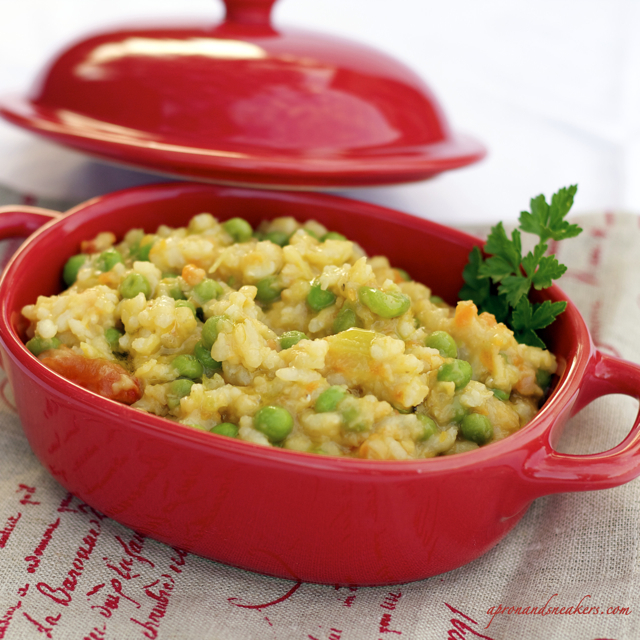 When the risotto is cooked, after about 17 minutes, and has a creamy consistency, turn off the fire. Add the Parmesan (adjust according to your taste) and the parsley then drizzle with extra virgin olive oil.